Black Architecture has been selected to partner with the Building Research Establishment (BRE) on their innovative refurbishment of a 1960’s office building project. This project is intended to research strategies for the comprehensive refurbishment of buildings of this type. The post war economic boom of the 1960’s and 70’s led to a considerable increase in the number of non-domestic buildings across the UK, including public sector, commercial, health and educational facilities. Buildings constructed during this period make up around 15% of London’s current offices and over 40% of the UK’s higher education building stock. space so no increase in value, despite being the most important intervention from the energy efficiency point of view. However, retrofitting and refurbishing commercial properties can offer significant advantages compared to building new: building programme benefits (with up to 70% time saving), with improved rental and yield values at a lower cost capital investment and retention of tenants. We want to demonstrate through this project that if refurbishments of 1960s and 70s non-domestic buildings are approached strategically and the whole supply chain is involved from inception, risks can be minimised, energy saved and profitability enhanced, with minimal disruptions to the operations in the building and without extra capital costs compared to standard comprehensive refurbishments. 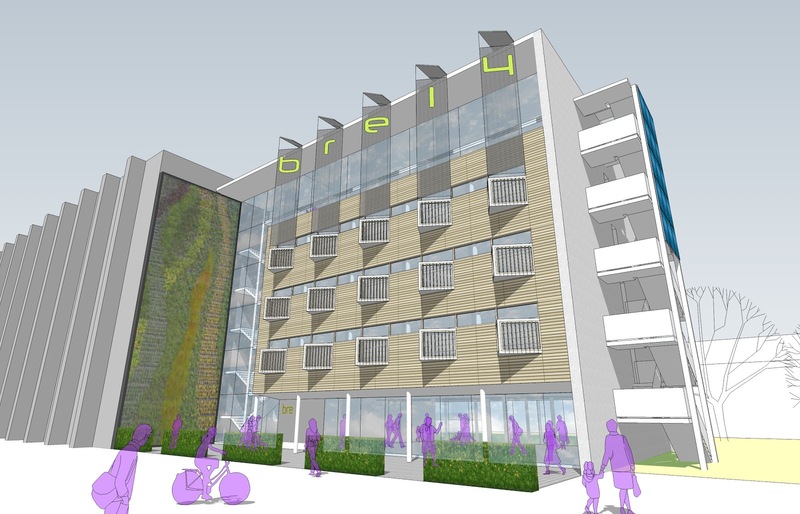 Built in 1964 with a host of problems typical of the buildings from this era , Building 14 at BRE overheats, uses an exorbitant amount of energy, emits 42 tonnes CO2/year , has a crumbling façade and as such it is an ideal candidate for a strategic sustainable makeover. It will be used as the physical demonstrator for a research and testing programme allowing refurbishment options to be valuated in a controlled environment. The key output from the project will be a performance specification / ‘balanced scorecard’ (strategic planning and management system), with the potential to be rolled out large scale to similar buildings. 4. Exemplar project, construction and procurement efficiency with minimal disruption to the day-to-day activities in the building. construction are typical of many other buildings from the period. It is prominent within the BRE campus, close to main reception and the Innovation Park, giving good visitor access and making it ideal for demonstration. It is currently an extremely inefficient building, with an EPC rating of E, therefore offering much scope for improvement. The building will be a live demonstrator of innovative technologies for the commercial refurbishment sector, which will be updated as new products become available on the market (parallel to the BRE Victorian Terrace domestic refurbishment project). The building will provide new accommodation that will be used as exhibition space open to Innovation Park visitors, business incubator space for start-up companies, office, meeting and seminar areas. A programme of dissemination and promotion will follow completion. This project will lead the way and influence the thinking of private and public bodies to change and embrace best practice, while happening right at the heart of the Government’s Green Deal implementation programme, and as such will receive extensive media coverage and public interest. More project we see the pipe is must for all construction for more check the pipe threading machine manufacturers.